Social media marketing has become very important and essential to many online firms and entrepreneurs. Whether the objective is getting feedback from customers, building email marketing list, improving brand engagement, increasing web traffic, or driving sales, social media has proven to be one of, if not the most, effective platform for achieving these business goals. Social media marketing tool has also proliferated brought about by the increasing demand for automated tools to help brands scale their social media efforts. Also called social media marketing software, these programs help large businesses, small business, agency and single proprietorships in bridging the gap between their marketing and social media efforts. These social media marketing tools can enable users to scale their social media campaigns, engage their customers, improve search rankings, and monitor online conversations about their brands, among other benefits. There is numerous social media marketing software available today, but two automated social media marketing tools stand out– MissingLettr and SendPilot– for their effectiveness, affordability, and ease of use. This article looks closely into the key features of both social media campaign programs and makes a comparison between the two, enabling readers to determine which social media planner tool is better-suited for their marketing needs. Why You Need a Social Media Marketing Tools? Create a great content for your blog is not enough to attract more visitor read the content. You should amplify your content by promoting it into social media like facebook, twitter, Pinterest, etc. (If you would like to know more about what is content amplification, please read one of our article here “What is Content Amplification?“). Especially for a new blog or website, a social media campaign is a must to leverage your content/site to different social media. This steps not only will attract more visitor to your site but it could help you to rank your site or content in search engine by increasing your social signal. But, develop and compelling a new post to your content will need a lot of effort and time or money if you hire VA to create or manage your social media campaign activity. This one the reason you should have an automated social media marketing tools which not only help you create a post to your social media but also manage or planning your social media posting as well. There’s a lot of tools out there but today we will discuss two beast tools in automation social media marketing, only. 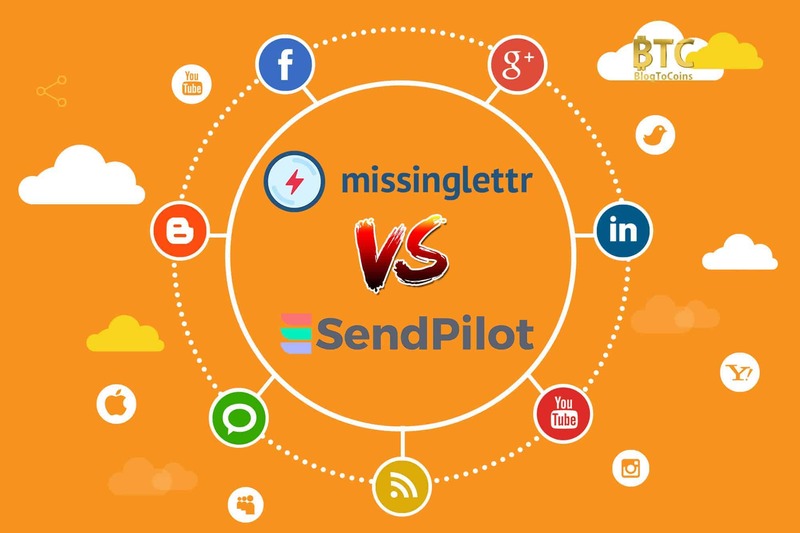 MissingLettr and SendPilot are one of social media content creation which generate your blog post into a social media campaign. MissingLettr is a social media automation tool that allows a user to create a target and automated social media content. With a few clicks, it automatically generates content and images for various social media platforms for an entire year. It is ideal for bloggers, journalists, reviewers, and online marketers who frequently post on blogs. MissingLettr is a freemium service, meaning that it offers simple and essential services to individual users for free while advanced features are available at a premium. There are two pricing categories– individuals and teams. The free package, which is only available to individuals, allows a user to connect to 1 website, launch two campaigns a month, and use one social media profile. This free plan has very limited options but enough for potential subscribers to learn how the tool works. They can then update to paid plans to enjoy more features. There are two other plan options available for individual users– personal and business. Personal, which is priced at $15 a month, is offered free for 14 days. This plan offers users to connect to 2 sites and launch four new campaigns every week. Users can also use four social media profiles, choose from two image-branding themes, and upload images. It also offers basic analytics and campaigns for previous blog posts. The business plan, on the other hand, is available for $40 a month. This premium service offers unlimited sites to connect, 10 new campaigns for launching every week, and connection to 10 social media profiles. It also offers numerous personalization options such as unlimited image branding themes, URL shorteners, custom schedule, and content templates, among others. There are also three pricing plans available for teams. The most basic plan is for Small Teams which is priced at $65 a month. It offers connections to unlimited sites, 10 new campaign launches per week, and up to 25 social media profiles to be connected with. It can only be used by one team member. The Medium Teams plan, meanwhile, offers connections to unlimited sites, 25 new campaigns a week, 50 social media profiles, and use of up to 10 team members. Pricing is $120 per month. The most extensive package, Large Teams, allows users to connect to unlimited sites, launch 50 new campaigns a week, and connect with 75 social media profiles. This plan, which can be accessed by 25 team members, has a fee of $230 a month. Users can change their plans whenever they like. It is also possible to switch between plans during the 14-day free trial. MissingLettr is relatively easy to use. It has a short learning curve, and most subscribers can immediately use it right away. Upon signing up for an account, users will be automatically brought to the overview page, which shows the social media profiles connected, number of active campaigns, and which are for review and activation. There are other important features available on the user dashboard. One is the Branding tab which is for customizing and editing images that the tool will generate when creating a campaign. Users may change the size and colors of the font as well as the backgrounds for each image. The URL shortener, on the other hand, allows users to choose from link shorteners like Bitly, Google, and PixelMe. There is also a Hashtag tool which gives users an idea on the number of times a specific hashtag has been used on Twitter which can guide them in their marketing campaigns. Depending on the plan, users may add websites that they want to create automated social media campaigns for. MissingLettr takes users’ RSS feed in generating campaign, allowing its subscribers to produce content with a few clicks of a button. In setting up the site to be promoted on MissingLettr, users only have to click on Settings then Website Settings located on the menu bar. The Site Settings page will show a form that needs to be filled out with details. Users can then add another site by clicking on their profile image located on the left side of the menu. This should set up users to organize their campaigns according to websites and add the appropriate social profiles for each website, leading to campaigns that are published on the appropriate social media channels. After setting up connections to websites, users will then have to add their social media profiles. This can be done by going to the menu tab then clicking Settings and Social Settings. There are four social media channels that user can connect with– Facebook, Twitter, LinkedIn, and Google Plus. After choosing the social media channel, users have to log-in and connect their accounts with MissingLettr. This should also be done in all sites that have been added. While MissingLettr automatically pulls in the latest blog posts, it can also allow users to manually add any URL address that they want to have a campaign for. In the Campaign page, subscribers can view the content that the tool has generated for review and activation. The auto post blog to social media program can create a default number of nine different social media posts during a 365-day period. No posts are alike with each post having a unique quote or image. Users, though, can change the number of posts, a number of days when the pots will be published, duration of the campaign and the distribution of the posts. There are also editable content templates or messages that the platform will generate on social networks. This can be accessed on the dashboard by clicking Settings and then Content Templates. One of the unique features of this platform is the automatic generation of quote bubble images which are to be incorporated in the social media campaign messages. It practically spares users from the hassle of having to look for stock photos online. The appearance of the quote bubble can also be easily adjusted. With just one click, MissingLettr subscribers can find the right image to pair with their content. Quote bubbles can also be downloaded using the Campaigns tab. This would enable users to create another social media campaign and use the same images accordingly. MissingLettr gives numerous benefits to its customers, perhaps the biggest of which is that it takes all the hard work out of social media marketing for bloggers, reviewers, and others who create content online by monitoring connected websites for new articles and creating social media campaigns out of it. Instead of having to prepare copy for social media posts, find photos and schedule the campaigns, MissingLettr subscribers can simply sit back, go through the generated content, and approve. And in case they are not satisfied with the generated content, MissingLettr subscribers may opt to customize messages and images. They can choose from different templates that would fit the look and feel of their campaigns. Generated content can also be edited although subscribers can also create their own if they are not satisfied with the ones available. Moreover, users can edit the text to match it with the image. The same goes with the image as this can be edited to conform with the message. Editing images and texts is a breeze; something that can be done in a few minutes. This social media planner tool also enables users to launch a year’s worth of social media campaigns. Moreover, they can make the campaign duration extend longer so that MissingLettr can promote their posts even after a year. MissingLettr is far from being the perfect social media planner tool. One obvious disadvantage is that it has limited templates to choose from. With a limited number of templates available, subscribers may be hard-pressed to choose a design that’s appropriate with their content. Another weakness of MissingLettr is its analytics tools, which can be described as basic at best. While this feature can show the number of clicks generated by a particular social media campaign, a downside is that it won’t reveal where those clicks came from. It also does not show which social media channel generated the most clicks or traffic to a post. In short, this analytics tool is not satisfactory enough for most users. 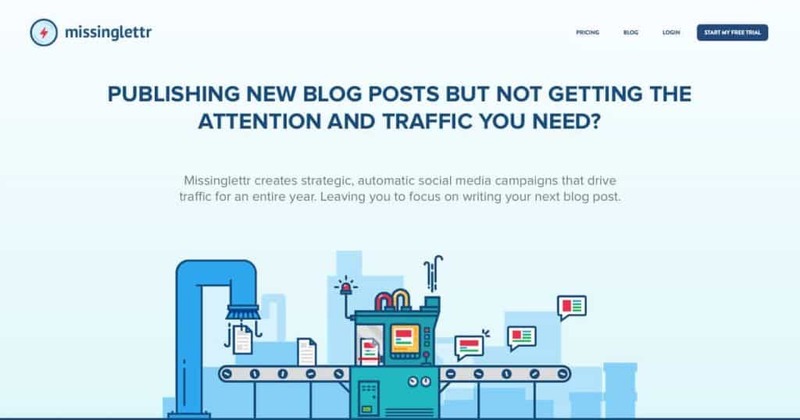 Like MissingLettr, SendPilot is an automated social media campaign tool designed for bloggers, reviewers, and content marketers. It helps its subscribers save a lot of time in writing campaign posts. By scanning blog entries then generating social media posts rolled out in a 12-month schedule, SendPilot gives its users the content they need to drive traffic to their respective websites. SendPilot is compatible with some of the biggest and most important social media channels including Facebook, Twitter, Instagram, and LinkedIn. It also works with popular website platforms like WordPress, SquareSpace, and Blogger. SendPilot has different subscription plans with varying rates. A free trial is limited to seven days although prospective subscribers don’t need to have a credit card to sign up for the service. Payment terms can be monthly or annually which offers up to 10% discount in rates. The most basic plan, Startup, has a monthly fee of $29. Subscribers opting for annual payment can get it for a discounted rate of $319. This plan has a limit of 80 posts a month and five social media campaigns for the same period. Subscribers can also connect with an unlimited number of social media profiles aside from getting live chat and email support. As the name of the plan suggests, this is the ideal package for bloggers, reviewers, and content marketers who are just starting out with their social media campaigns. The next plan, Growth- Unlimited Posts, has no limit on the number of posts per month. There is also no limit on the number of campaigns and connected social media profiles. This package can be had for a monthly rate of $49 while the discounted annual rate is $490. The most comprehensive subscription plan is the Agency Plan. As the name suggests, this package is ideal for digital marketing agencies who service the social media requirements of various firms. Payment is monthly although SendPilot says it would soon accept annual payments for this package. Under this plan, subscribers can use up to 10 client accounts and get access to the Whitelabel Client dashboard. Posts and campaigns per month, as well as the number of connected profiles, are also unlimited. Users can even get live chat and email support. SendPilot has reasonable rates which make it such an appealing option for bloggers and content marketers. It’s way cheaper to subscribe to this social automation campaign tool than outsourcing the work or hiring an online assistant. It appeals to start-ups who may be struggling to find the right words for their social media campaigns or find the right photos to go along with their content. Similar to MissingLettr, SendPilot has a short learning curve. Users can easily find content and articles from their blogs or websites that they can share with their audience. SendPilot creates social media posts out of those articles and recommends images to go along with the posts. Users can edit or change the images, edit the content or even change the schedule of posting. SendPilot has an intuitive user interface. It is built for everyone regardless of their technical proficiency. The dashboard has a nice, clutter-free design with users able to view their posts, scheduled date, linked social media accounts and post content. Creating social media posts out of blog articles is as easy as copying and pasting text or the URL of the blog post and then clicking the Build Campaign button. Alternatively, users may upload blog content that they have created for their website. SendPilot then analyzes the content and identifies the key sentences, phrases, and words to be included in the social media posts. Subscribers then have the option to approve or edit the posts as they see fit. Clicking the approve button will automatically schedule the posts using Zapier and Buffer. 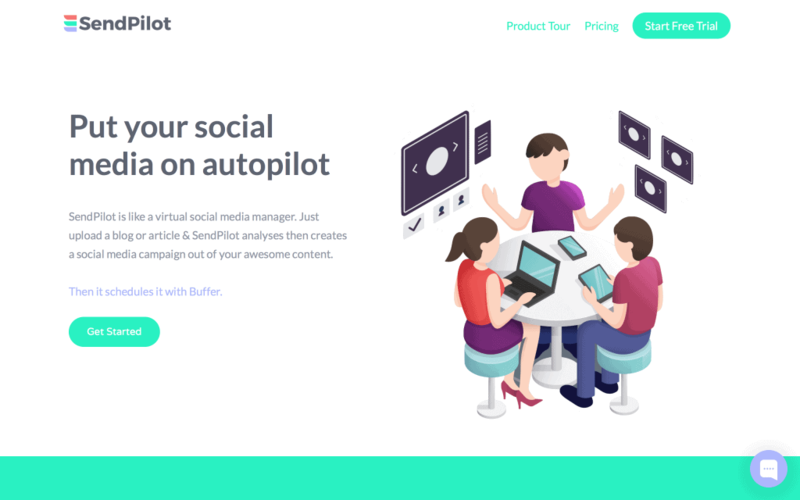 SendPilot also pulls in the images from the blog content where the social media post was based from, giving extra engagement for the subscriber’s followers. There’s also a lot of customization options offered in this software. For example, subscribers can choose from the post templates created and made available by SendPilot. These templates will then be included in their campaigns. They can also edit the posts by adding a video URL or rewording the post. All these can be done with just a few clicks. Like MissingLettr, SendPilot allows users to add hashtags to their posts. Even better, the program searches for the latest trending hashtags and presents these as suggestions. Subscribers can easily and quickly insert these hashtags to their posts. Graphics are also editable, and users can choose from hundreds of available templates aside from thousands of stock photos. Uploaded images are also saved in a library, giving users the option to reuse them in the future for multiple posts. SendPilot can also search for articles related to a user’s industry and use them into influencer posts. This can spare subscribers of the hassle of searching the Internet for content. Through its RSS feed detection, the program can also detect if there’s a new blog post so that it can turn that content into a social media post. By default, the platform schedules social media posts for roll-out over the year. Subscribers can change the schedule of their posts by picking a date for a post to go out. This program is not only for bloggers, reviewers, small businesses and solo entrepreneurs; it can also prove to be a vital tool for digital marketing firms. Subscribers of the Agency Plan of SendPilot can use the program in easily creating social media campaigns for their clients. They can create a branded portal for their clients to log-in and allow them to connect their social media accounts as well as to track their posts. SendPilot is an intuitive, easy-to-use application that practically eliminates the need to write social media campaign posts for business owners, bloggers, reviewers, or any individual or party needing to drive traffic to their websites to generate income. By generating social media posts in as short as 30 seconds, the program does the work for its subscribers. There is no need to write a social media campaign copy, look for stock photos or images, identify quotes, and upload the post on Facebook, Twitter, LinkedIn, and Instagram. There’s also no need to waste time in sending back-and-forth emails with digital marketing firms. SendPilot takes care of all these tasks, sparing its subscribers from the manual tasks involved in the said process. In turn, subscribers can focus on more important things like growing their business or spending time with their family. The quality of the social media posts generated by SendPilot is not to be scoffed at. The platform generates engaging and compelling posts on social media as if these were written by real copywriters. Moreover, those posts are distributed online to reach the desired target markets, spur them into action, and consequently, prompt them to visit the online store being promoted by the social media post. This social media manager program also schedules the social media posts to drip feed content over the year. This way, the content of a subscriber is kept evergreen ensuring that online traffic is generated consistently. Additionally, subscribers may change the schedule of the posts as they see fit. SendPilot can do all these things for surprisingly low rates. The entry-level plan is at $29 which is the cost of a few cups of coffee. For such a reasonable fee, the program can create engaging social media posts that can drive traffic to a website and ensure its profitability. However, SendPilot does not offer any analytics tool. This can prevent its subscribers from getting a deeper understanding or analysis of their social media campaign as they won’t know which of their posts got the most number of clicks, among other vital details. On the surface, MissingLettr and SendPilot appear to be the same type of application built to assist bloggers, online retailers, and content marketers in launching social media campaigns to boost online traffic and increase sales. But a closer look at the features of both programs shows that SendPilot is the program that provides more value for money to its subscribers. While the two programs have similar features such as automatic social post generation, social media scheduler, and calendar, SendPilot offers more functionalities to its subscribers. For one, SendPilot can be used to generate posts on Instagram, something that MissingLettr does not offer. With more than 1 billion active users, Instagram is considered the fastest-growing social media channel today. It is an important and audience-rich social media platform where SendPilot can distribute social media posts. SendPilot also offers content curation services, unlike MissingLettr. It scans for relevant articles from top sources like Forbes and BBC which subscribers can then share with their audience. It is a vital tool that can help content providers to share relevant and valuable information with their target markets. Furthermore, SendPilot can enable its subscribers to automatically tag influencers in their content curation posts so that their posts can reach a wider audience and as a result, drive more traffic to their respective websites. Regarding pricing, the base plan of SendPilot available at $29 a month is still cheaper than the business plan of MissingLettr which has a monthly fee of $40. Finally, SendPilot allows its users to go on Facebook Live with just a click of the button. This is another function that MissingLettr does not offer. Facebook Live is a tool that’s been proven effective in increasing engagement and thus should help SendPilot subscribers in engaging their followers on the popular social media site. To sum things up, SendPilot and MissingLettr are two of the most popular social media management tool today. While the two applications share some similarities, SendPilot offers more features useful to its subscribers at a lower, more budget-friendly price. Now, we have a special deal on PitchGround for $49 one-time payment, you could get a lifetime service of Sendpilot. Check the offer here.